ViewRanger, the award winning outdoors GPS navigation app, today announces an enhancement to their web-based community & route planning tool My.ViewRanger.com, so that whole of NZ LINZ topographic mapping is now viewable and can be used to plan routes more accurately. By adding online access to LINZ topographic maps within the My.ViewRanger website, the company has created a fully integrated web and mobile outdoors route planning and navigation service. 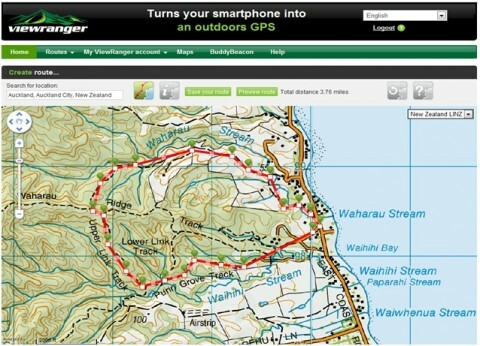 ViewRanger users can now view the maps for the whole of NZ online at no additional cost. The ViewRanger app is designed to work without mobile coverage, this is done by downloading and storing the maps for the area or region required. For off-line, mobile usage, customers can purchase the LINZ mapping they need either in-app for Apple and Android devices or via the Viewranger web shop for Symbian smartphones. Ready for the start of this summer season ViewRanger have reduced the purchase price for all LINZ mapping and introduced easy to install low cost regional maps for Apple & Android devices. Up until today, the My.ViewRanger website has offered route planning and discovery using open source global web map layers such as Google Maps, OpenStreetMap and Satellite imagery. From today, all customers can now additionally, use the website to view the whole of New Zealand LINZ 1:50K mapping is available to view and use free of charge. ViewRanger are also launching access to premium mapping for GB, Ireland, France and Germany and plan to add further countries from their global mapping portfolio onto My.ViewRanger.com in the near future. Premium mapping describes all official cartographic agency maps ie LINZ, GB Ordnance Survey, or US National Geographic Topo!. It is free to create an account on My.Viewranger.com. The service allows users to view and plan routes on LINZ mapping for the whole of NZ online at no additional cost. However, for other countries there are web-view annual whole country subscription packages (online only) to plan routes on, prior to purchasing areas for mobile off-line use.